Learning how to raise baby chicks is pretty easy, but there are somethings you need to be attentive to. There are some hard and fast rules, and in this podcast we discuss them all. By the end of it, you’ll feel ready to bring chicks home and start them off successfully. I have some pretty strong opinions about what baby chicks should eat, as well as how many should be in a brooder, but it’s not arbitrary – they’re best practices based on my own experience and research. Hi there, and welcome to session 21 of What the Cluck? !, a podcast devoted to keeping chickens for fun and self-sufficiency. I’m Maat from FrugalChicken, and in this episode we’ll talk about the how to raise baby chicks, including the basics of what you need to know. So, we’re going to cover feed options, brooders, necessary equipment, temperature, and lots of other stuff to get your chicks started on the right foot. This will be a valuable episode that’s full of advice you can use today. Just as a reminder, you can get this episodes show notes at TheFrugalChicken.com/Podcast21, that’s podcast with the numbers 2 and 1. When it comes to how to raise baby chicks there are some things you need to make sure you have on hand as well as somethings you need to do in order to raise them to laying hens and roosters. Let’s start first with feed, since this is the biggest question I get. When it comes to chick starter, I think this is actually pretty easy. You want to make sure your chickens get an 18% protein feed, and that amount of protein is necessary for them to grow correctly. I don’t really recommend going lower or higher than that, there’s enough evidence out there to suggest that 18% protein is really the ideal amount. You can go with a homemade over a commercial feed, but if you’re new to chicks or aren’t sure what you’re doing, then I would stick with a commercial chick starter ration. It’s easy, and doesn’t require extra research, and you know it’s correctly formulated. If you’re worries about GMOs and everything, then there’s non-GMO options out there, as well. Of course, there’s also organic options. With homemade feeds, some people feed a mixture that can include a lot of different things like corn meal, wheat, barley, peas, etc. But the bottom line with a homemade feed is you will need to have some way to grind it, like a grain mill for example, and those can get pretty expensive, in order to get the feed to the right size for your chicks. So, to save time and reduce potential issues with nutrition, I really recommend, for now, going with a commercial chick starter. It’s only for 12 weeks, and after that, you can go with a homemade grower and layer ration. When it comes to chick starter, you can either go with an non-medicated or medicated feed, and the difference is a medicated chick starter has medication in there to help chicks build up an immunity to parasites that are naturally found in soil. It doesn’t cure anything, it just helps them build up a resistance. It’s completely up to you whether to feed an non-medicated or a medicated feed. Personally, I feed a medicated chick starter, and the reason is that there’s so much already going against chicks when they’re young, that I like giving them every chance to build up a resistance to parasites. I then switch to a homemade organic ration when they’re 12 weeks old. But that’s just my personal preference, and you can do whatever you feel is best for your flock. Regardless of what chick starter you go with, you want to keep feed in front of them 24 hours a day until fully feathered, which is at about 12 weeks. The exception to this rule is Cornish crosses. When it comes to how to raise baby chicks like Cornish Crosses, they should not have feed offered to them 24 hours a day after 3 weeks of age because they grow so quickly and it can cause problems with them gaining weight too quickly, which can lead to things like heart attacks. Offer during the day, and remove at night. You can also offer your chicks herbs, finely ground herbs, such as oregano and sage. I would add these in only lightly, but both are proven to boost the immune systems of chickens and lower the pathogen load in their digestive system. If you do offer these herbs, then also offer your baby chicks some finely ground grit to help them digest them. For the most part, chicks don’t need grit if their only diet is water and chick starter, since commercial chick starter is formulated to be digested easily. But if you plan to offer anything other than chick starter, then you should provide them grit as well. If you do offer them leafy greens or treats, that’s perfectly fine as long as it’s not too much or too big for them to swallow. Another option, if you don’t want to feed them directly to your baby chicks, is to crush them, then put them in water and let them steep for a few hours before giving them to your chicks. READ NEXT: WHAT TO FEED CHICKENS FOR GREAT TASTING EGGS! Now, something that I strongly recommend to people who are learning how to raise baby chicks are probiotics that you can easily dissolve in their water. I used to balk at these, largely because they’re not regulated, so you have no real idea of what your buying, but also because most companies that produce these, I’ve found could not give me a reasonable explanation why they included the bacteria they did, and that irked me. Why sell a product if you don’t know why it’s formulated the way it is, right? But after some research, I found a company that I like, so I started giving chicks a probiotic and found that it actually reduced my death rates. Something else to offer your baby chicks is apple cider vinegar in their water. This is another great way to get probiotics into their systems, and of course, if you’re offering apple cider vinegar, it should be raw vinegar with the mother included. If you don’t know what the mother is, is the collection of beneficial bacteria that gathers in homemade apple cider vinegar. The beneficial bacteria in ACV has been proven to also reduce the pathogen load in chickens. Now the next thing you’ll need to learn how to raise baby chicks is a heat source, and in many ways, this is just as important as deciding what to feed them. Need it to be about 90 degrees in brooder, and decrease 5 degrees each week until it’s about 75 degrees or so in the brooder. The thing about temperature is It’s extremely important, but if it varies a bit, 5 degrees for example, it’s not the end of the world, just try to keep it as close to the ideal temperature as possible. When chicks are cold, they don’t eat or drink, they try to get warm, so if your brooder isn’t warm enough, you run into problems of death related to starvation and dehydration. So temperature is pretty crucial to your chick’s survival. Obviously, too cold is bad, but too hot is bad also, and I’ve had more chicks die from overheating and getting squashed by other baby chicks than I have with chicks dying from getting being too cold. Stay away from red bulbs. Go with a 75 watt bulb, they don’t get as hot. Next on our discussion of how to raise baby chicks are brooders. When it comes to brooders, the amount of chicks that can be in the brooder depends on the size of the brooder itself. I personally use Tubberware bins as brooders, and in a standard size one, I only like to put 10 or so baby chicks in each one. Yes, that means I need more feeders, waterers, and heat lamps, but in my experience, putting more in the brooder leads to issues of unsanitary conditions and trampling. So, chicks are really messy, and love to kick shavings and bedding into their waterers, and the more chicks in the brooder, the more likely the waterer is going to get clogged up pretty quickly. In addition, chicks will poop in the water, and the more chicks, the more disgusting the water gets quicker. When I’ve put too many baby chicks in a brooder before, in the past, there’s also issues of the chicks getting dirty from other baby chicks pooping on them, and it gets difficult to remove dried poop, you have to wash them with a damp rag, which leads to issues of possibly getting too cold. There’s also issues of chicks getting wet if they get pushed into a waterer, which can cause them to get dirty and cold, so that’s why I really recommend limiting the number of chicks in a brooder to a reasonable amount. Trampling, and chicks dying from suffocating, is also an issue in brooders with a lot of chicks. And I know when you go to the feed store and see the chicks in the large stainless steel tubs, the kind of tubs made to provide water for cows and large livestock, there’s a lot of chicks in there, but those chicks get sold pretty quick, so they’re not spending a huge amount of time there, and you don’t see whatever mess they clean up before the store opens. So, I personally try to limit the size of the brooder as well as the amount of chicks in the brooder itself. When it comes to brooders, they’ll be in there for a while, and chicks grow quickly, so if there’s fewer chicks in the brooder, as they grow, they will still have enough room. Depending on your brooder and the size of your chicks, you also might need to put them in a bigger brooder as they grow, especially if it’s still cold out and they can’t safely go outside. When it comes to bedding in your brooder, you have a few options, and they’re all equally good. When learning how to raise baby chicks you can really, actually, use anything as bedding as long as it’s safe for your chicks and you can clean the brooder out easily. I like to go with large flake shavings, and the large flake is really important because they can accidentally eat the sawdust shavings, and I’ve also used straw, which they seem to like. They get really excited about it, and I think it’s because there’s microscopic bugs on there that they can see but we can’t. Other options are paper towels, which do a good job of soaking up manure and are easy to clean. I would steer away from newspapers since they don’t absorb wetness as well, and I promise you that your baby chicks will spill their water at some point, and you don’t want them getting wet like we discussed. The newsprint also is not good for them. So next we’ll talk about the proper feed and water equipment. For this, you can buy either plastic or stainless steel cleaners, and I like these because they’re easy to clean. I personally prefer the long feeders rather than the mason jar feeders because all the chicks can get to it and they’re easier to clean. I like to use 1 of those long feeders per 15 chicks, and other people might recommend different, but this is just what I recommend. In my experience, having more feeders is better than too few to make sure everyone gets enough food. With waterers, I prefer the mason jar waterers because they’re easier to clean. If you don’t know what these are, they’re bases that you can just screw a mason jar into as your waterer. When the mason jar gets dirty, you can just unscrew it, and clean with a natural cleaner. Overall, I just find them easier to sanitize and they’re cheaper. If you have a lot of baby chicks, a hundred or so, then the mason jar feeders will likely be too small, but there are bigger size options available. You can find the waterer I recommend at TheFrugalChicken.com/waterer. Now, you can hang the waterers, or you can leave them on the ground. If you hang them, the advantage is that it’s harder for chicks to get shavings and dirt and stuff in there to clog it up, but just remember you need to leave it low enough for the chicks to get to. When it comes to equipment, the biggest thing is to make sure you have enough of them for the amount of chicks you’re feeding. One of the biggest issues I’ve seen with chicks dying is because they weren’t able to get enough food because other birds were getting there before them. When it doubt, just offer more places for them to eat. So, that’s this week’s podcast, and I hope it gives you some idea of how to successfully get started with chicks. 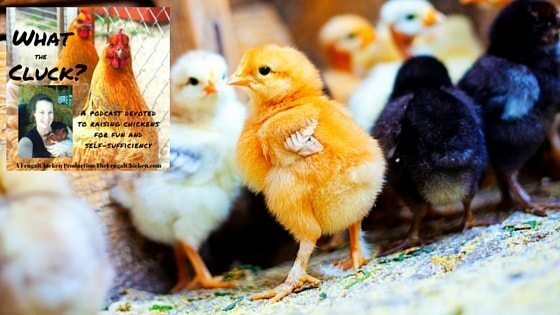 Now, if you’re interested in learning how to raise baby chicks and want some extra help, I actually have a book available on Amazon which can help you get started. 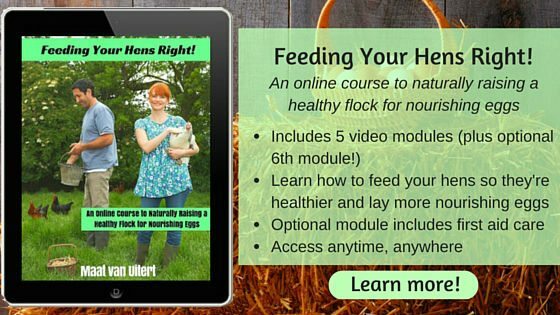 It’s a 50 page ebook all about how to naturally raise a sustainable flock of chickens. You can check it out at TheFrugalChicken.com/chickenbook. Thanks for listening to this episode of What The Cluck?! about how to raise baby chicks, and I’ll see you next time! Here's how to raise baby chicks and get them started from day one. You'll also discover what to do to reduce death rates.